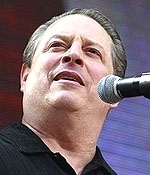 JULY 17--If you're looking to book Al Gore for a 75-minute "Environmental Multimedia Lecture," the former vice president will cost you $100,000, plus travel, hotel, security, and per diem expenses. Gore's standard speaker's contract, a copy of which you'll find here, also stipulates that the Democrat's ground transportation be "a sedan, NOT an SUV." Additionally, Gore requests that speech sponsors make every effort to use a hybrid vehicle for his transport. The Gore contract, which is more restrained than the one used by Rudolph Giuliani, stipulates that no press be permitted at the event and that the Democrat receive approval over the distribution of photographs from the appearance.